Sometimes good for something, the Daily Mail revives the link to Jon Doe's amazing flickr stream of the Fleet River labyrinth of tunnels. Where the River Fleet once flowed overground wide (up to 65 feet north of Camden), and eventually rampantly polluted, for several miles from Hampstead Ponds to the Thames, now it snakes under the streets from Camden down to to the Thames near St Pauls. 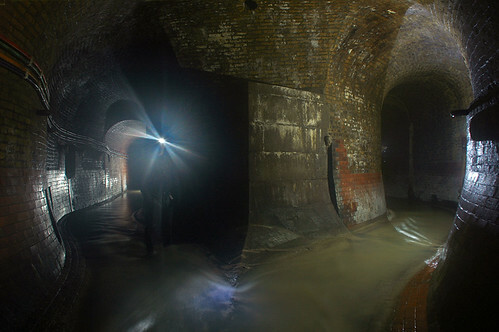 Buried beneath the streets properly when Joseph Bazalgette's engineering marvel, the sewage system, was created in the 19th century, many walking above are only vaguely aware of what lies beneath. Underground is the otherworld, a maze inaccessible except, for the most part, the dares of urban explorers, with a rich history only bits of which have room to surface here: old gods and Romans, tanners and butchers, pirates and pagans, smugglers and mudlarks, wells and spas, Dickens and the wild hogs, eels and rats and, it's said, even scorpions. Visually, the tunnels are on a grand architectural scale, with Victorian brickwork and flagstones and, since they were built not only for sewage but also for snowmelt and rainwater drainage, in parts 20 or 30 feet height. A perfect place for all kinds of mystery and menace. Paul Talling's London's Lost Rivers and, on the always fantastic Strange Attractor imprint, Tom Bolton's London's Lost Rivers: A Walker's Guide as well as Peter Ackroyd's London Under are go-to books for more about these subterranean waterways. The tunnel is artistically done. The sewage system works perfectly well with the architectural design.